Here is a refresher on why we switched to a Whole-Food, Plant-Based Diet. In our pre-WFPB days, one of the things that was becoming a trend for us was eating out sort of frequently while on the road. We were “treating ourselves” to greasy burgers, poutine, BBQ and the like on a weekly basis while discovering new places to eat. We went from eating out mostly during our road trips to eating out most days of the week, even when we’re working at home. This was the gateway into saying we’re too busy at home to grocery shop/cook so now we’re eating out most nights, even when at home. After all, it’d be easier to run down the street and get a taco salad or up the hill to get Chinese takeout, right?? Why was it so easy to eat like this? Because french fries are awesome, right?! Also, because our bodies weren’t properly nourished. Sure we were eating all the time and “full” to the point of misery but we were full of nutrient empty calories and calorically-dense foods that were just slowing us down, increasing our blood pressure and sucking the energy right out of us. As mentioned in Part 1 of this transition, we fully embraced the 7 day challenge and stuck 100% to plan, which is no dairy, meat, salt, oil or sugar. 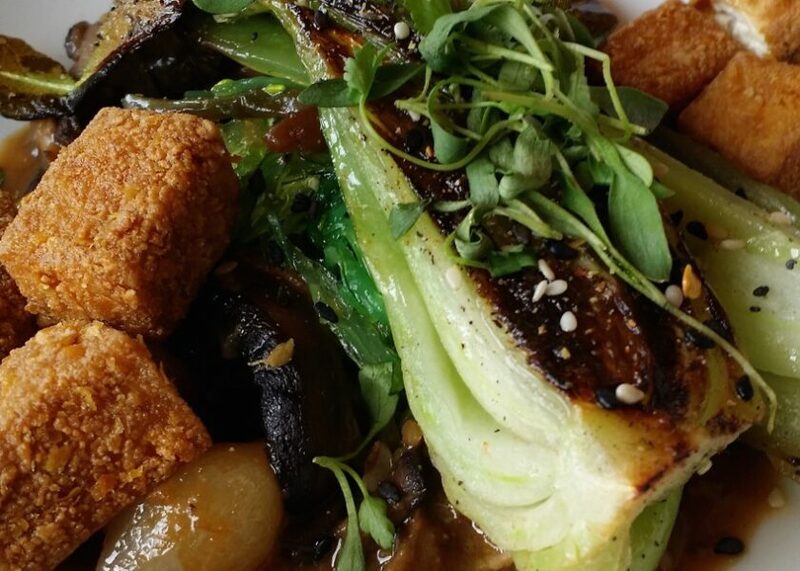 Here is one of our favorite dishes yet that is vegan- marinated tofu. It was divine. No sacrifices made with this meal choice! It’s possible to feel full while you’re eating. We always heard this could happen but never truly experienced it ourselves. LOL. Pre-WFPB, Dusty and I ate well beyond a point of satisfaction. Eating WFPB foods truly makes it possible to feel full & satisfied while you’re eating! Our taste buds changed! We both noticed that the literal texture of our tongues changed we actually felt our taste buds and foods tasted better. Sweets got sweeter! The aches and pains went way when we got out of bed in the morning. Ahem, our number 2’s are frequent & satisfying. The real proof that eating a WFPB diet works was having my blood pressure taken and it being lower than it’s been in probably a decade, even while on blood pressure medication! After talking to my doctor who happened to have actual nutritional eduction, we came up with a plan for me to get off of the blood pressure medication completely! She also suggested that my winter-long allergies might possibly go away entirely. What?! The big question, is Dusty’s Solar Urticaria gone? No. He is learning to better manage the symptoms. We hope over time this Solar Urticaria will improve or go away together entirely but in the meantime we feel great knowing that we’re feeding our bodies what our cells required WFPB! To date (May 14, 2017), Dusty has lost 41 pounds and Kelly has lost 37 pounds. Kelly is now off blood pressure and allergy medications. To be honest, the weight loss is an awesome consequence of eating WFPB. It’s obviously the most noticeable but the real magic is what’s happening to our blood pressure and our health. The best part is we feel like all we do is eat!! We’re eating all the time and feel full! Are we where we want to be? No, but it’s a journey and one we plan to continue on. So what does eating WFPB mean for Dining Duster? Not much! We’re still eating out when we travel, the difference now is we’re not eating burgers, poutine, reuben sandwiches, etc. Now we might opt for Pad Thai, baked potatoes, salads or other things that are the best choices on the menu. Surprisingly, it is very easy to order “vegan” options. They may not be perfect. They likely have salt, oil & sugar but we’re making the best choice we can in an imperfect world and then resuming a stricter WFPB without salt, oil & sugar at home. We also hope to share more about our love of gardening, which will be heightened now that our diet almost solely depends on fruits and vegetables. We also will do more cooking so we’ll be sharing some of our tried and true recipes. You don’t have to be WFPB to enjoy you just need to enjoy good-tasting foods! Well, some might argue yes but, absolutely not. We’re not judging what you eat and we would hope you won’t judge what we eat. Even though at home we limit processed foods and omit cooking with oil, salt and sugar, it doesn’t mean we’ll never eat those things again, especially when we’re eating out. Might we order french fries when we’re eating out? Possibly. Just to clear the air, there is a difference between a healthy WFPB and a non-healthy WFPB eater. For us, it’s about the health of eating WFPB and not just about avoiding meat and dairy products. We’re only a few months into what we feel is a life-long adventure of eating WFPB. It will be a fun journey that we plan to continue and we hope you’ll enjoy our adventures right along with us. We will conclude this WFPB series with a list of helpful resources we’ve found along the way.